I haven’t followed this series of exchanges closely (an omission I’ll correct when I’ve kicked this VAT return into shape) but it’s an interesting and at least to me counter-intuitive conclusion. Part of the failure to “intuit” the correct answer is certainly the language used when encountering these concepts for the first time. Thinking back, my mental diagram always shows a one-way heating effect from a hotter to a cooler body. What I failed to do all those years ago is to take note that this was almost certainly described as a *net* flow of heat, rather than a strictly one-way street. Thanks for the correction; I’ll revise my mental model and internal dialog immediately. I love your choice of textbook here – it’s particularly good for radiation, as it does not gloss over nuance. But I thought your point about Kirchhoff’s law and the difference between emission and emissivity would be easier to illustrate if you just wrote down a couple equations, so that you can at a glance see the relationships between these terms. Sorry to be a party pooper as you seemed to be in a particularly good mood. Did you notice the little point about thermal equilibrium. When we talk about a hotter body and a colder body radiating to one another. These bodies are not at thermal equilibrium. Kirchoff’s Law applies to the properties of an individual body. Suppose you had two spheres inside a perfectly reflective cavity, one with an absorptivity of 1 and one with an absorptivity of 0.5 and a transmissivity of 0.5. Kirchhoff’s Law says the the emissivity of the first body is 1 and the second body is 0.5 whether the spheres are at the same or different temperatures. If the partly transparent sphere is at a higher temperature than the opaque sphere, it will still transfer heat to the opaque sphere until both are at the same temperature. Great care must be exercised when using Kirchhoff’s Law. This was pointed out by Gerlich and Tscheuschner however some folk choose to ignore their guidance. There is an article below which goes into much greater depth on Kirchoff’s Law and I’m sure you will find it interesting. on May 22, 2010 at 8:39 pm | Reply Matt J. To what extent can we count on the review process at this journal to filter out obvious junk? This same author published a letter in that same journal claiming that the famous 4K background radiation is not from the Big Bang, but from the Earth’s oceans. I have great difficulty believing either conclusion. A plant that is absorbing certain colors of visible light does not emit in those same colors, simply because it isn’t hot enough to do so. 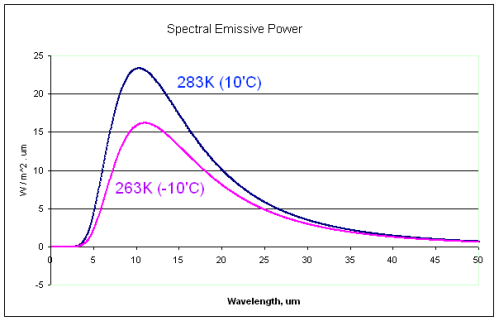 Something can have a high emissivity at some wavelength, but never actually radiate at that wavelength, because it isn’t hot enough. For newcomers, I’ll start answering Bryan’s comments if others want clarification, or in the unlikely event that he starts making consistent substantive responses to questions or points. See the links early in the article for examples. ….”A plant that is absorbing certain colors of visible light does not emit in those same colors, simply because it isn’t hot enough to do so.”….. The plant does not need to radiate at all, if the photons energy is changed into some other form, such as chemical energy(Starch). Continuing from previous…… other that greybody radiation. There is no conservation of radiation principle in physics. Cthulhu: You are proposing something that simply doesn’t happen in nature. Light crossing from opposite directions does not cancel out so that energy doesn’t arrive. Gord: Answer: Yes, if the two bulbs are exactly the same in terms of their magnitude and phase characteristics, their light will completely cancel for those field vectors that meet with equal magnitude and opposite phase. Cthulhu: You are claiming that the energy from two torches facing each other is destroyed midway. That if two people were to stand in a field and point torches at each other, neither person would be lit up because the light would never reach them. Gord: Answer: I have never claimed that energy is destroyed! The multitude of links showing cancelation of fields don’t claim cancelation is destruction either. The Physics absolutely show that cancelation just reduces the intensity of the radiation to zero. Cthulhu: Then where does it go? If you claim the energy doesn’t reach the target then where does it go? There are only two options. Either it goes somewhere other than the target, or it is destroyed. If by “cancelled” you mean 300 joules of energy flying from one end of the room to the other simply vanishes, then that is destruction of energy. Gord: You ask a question that is still being debated in science. Although, most circumstances cleary show that wave cancelation is followed by a wave addition such as what happens in the atmosphere with backradiation..Example: The Earth radiates, say 390 watts/m^2 and the backradiation from the atmosphere is say 50 watts/m^2 then the 50 watts/m^2 is canceled and the net radiation is upward from the Earth at 340 watts/m^2. The atmosphere also radiates the 50 watts/m^2 upward which adds to the the 340 watts/m^2 to produce a net upward radiation past the atmosphere of 390 watts/m^2. This conforms with conservation of energy. He cited an equation P = e*BC*A*T^4 – e*BC*A*Tc^4 a lot, with the claim that this proved that backradiation is “cancelled out” by “vector addition”. He uses the terms “field”, “cancels out” and “vector addition” a lot. Q. How many tennis balls does the earth receive per minute? Gord replied: There are ONLY 8 Tennis Balls a minuite…that’s it! Cthulhu…you just DON’T UNDERSTAND CONSERVATION OF ENERGY! If you use the tennis balls as energy…there are only 8 tennis balls! I’m not quite sure the point you are making here. I think you are saying that 8+4 balls a minute hit the earth, and also that 8 balls a minute leave the earth. So you are saying that the earth is accumulating 4 balls a minute? If so, wouldn’t get very hot on earth? Assuming the balls are units of energy? – how it is that he hasn’t supported his earlier claims when he says “a lot is not absorbed”…..
SoD I fully accept that absorptivity of the material can change at a given wavelength. Here are some emissivity values from omega that would be found in an urban environment. The value for slate shows the effect of temperature and the other values are around 20c temperature. Its quite clear that any radiation falling on these surfaces will not be totally absorbed. I am open to persuasion about exactly what happens to radiation reaching a surface that is not at thermodynamic equilibrium. 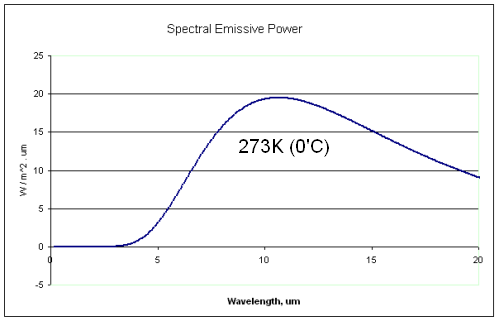 In particular caution should be observed when the surface is at a higher temperature with associated spectrum being radiated by a lower temperature and spectrum. Gords Solar Oven test does not indicate “backradiation” having any heating effect on the Earth Surface. Further after reading the paper below I would recommend a little more care in the use of equations and “laws” that are being potentially applied to situations where they are not fully applicable (as G&T warned). Physicists always give primacy to “experiments”. An equation or theory may look neat and attractive but if the experimental evidence is not there it must be discarded. good point Jerry – I was wrong to use those numbers. 3, 8, 5 would be better. I think the whole issue is related to the type of balls. Say 8 sun-balls arrive, 3 are reflected, 12 earth-balls depart, 6 sky balls arrive and are absorbed. The only question is how much energy sun-balls, earth-balls, and sky-balls carry. On that, we can agree. Where do you get the idea that there is? There is no requirement that absorption and emission will be equal at any given wavelength. There is only the requirement that absorptivity and emissivity be equal at any given wavelength. This is laid out by Doom above. Bryan, everything with a temperature greater than 0 K, meaning everything, will radiate. This is easily measured. For any given material, the higher its temperature, the more it will radiate. Perhaps you missed that bit. If the Imaginary Second Law of Thermodynamics is correct then the light curves from eclipsing binary stars will wax and wane in a manner akin to Venus, as the ‘reflecting body’ will go through phases – reflecting an increasing amount as it waxes, and a decreasing amount as it wanes. However, this is not seen – the only decreases occur when one of the stars covers the other, at all other times the light curve is flat – ‘reflecting’ the fact that both stars are clearly visible and contributing a steady illumination. I think you still have the tennis ball analogy wrong. It’s your statement #2 where you have 8 balls/minute from the earth to the atmosphere. That should read 8 balls/minute from the atmosphere to space. Then you can have 4 balls/minute from the atmosphere to earth and 12 balls/minute from the earth to the atmosphere with no continuous accumulation. I can’t extract any meaning from this statement, so please expand it. What I’m saying about emission and emissivity (that they are two different concepts) is true , whether you make the grey-body simplification or not. I hit the keyboard before remembering to add the default radiation( Blackbody/graybody) emissions so I quickly added it. On whether the green plant would emit some extra radiation as well as usual graybody emissions I am open minded. Some of the energy of the initial photon could be emitted at a longer wavelength if it were not used up in chemical energy transfer. I have no idea what this means – what is “extra”?. The plant will emit, according to its temperature and its wavelength-dependent emissivity. No more, no less. Let’s not complicate that which is simple. …Let’s not complicate that which is simple…..
…On whether the green plant would emit some extra radiation as well as usual graybody emissions I am open minded…..
in to show I’m not inflexible in outlook. Note the “open minded” qualification. Well, Bryan, can you clearly re-state in one place exactly what it is that you are saying? on May 23, 2010 at 12:28 am | Reply Matt J. The third blog S of D refers to itself refers to yet another blog, where I think we can find the precise statement of the ‘imaginary’ (I would say delusional) version of the 2nd Law seems to be definitively stated. I say ‘seems’ because I leave it to the reader to judge whether the author really got it right: I think he did. The rest of my post will assume that. That’s it! No consideration of the “compensating changes” Pauli mentioned in his statement of the law, no consideration of the cycles Thomson (Kelvin) made reference to in his statement, nor of other sources of energy entering the system! Not even a reference to entropy. So excellent though the analysis in “Excellent Materials…” is, did we really need that much detail to expose their error? Why do we need anything more than just to point out what they left out in their formulation of the 2nd Law? “As shown in Section (3.9), the second law requires consideration of ALL [emphasis mine] heat flows in a process, so one must also include the transfer of thermal energy from the surface to the atmosphere. Ref. 1 does not consider this second part of the process and thus errs. When done properly, there is no contradiction”. Now again, I said ‘seems’. But this time, I want to close the gap and show that it really is exactly so. To do so, I refuse to repeat the mistake of relying on Wikipedia, or dimly remembered misplaced books; instead I will quote directly from Pauli, following with my own words summarizing his explanatory comments. That was a cumbrous sentence, as is to be expected in an English translation of a German original, so I will reformat and reword, but only after pointing out that Pauli is giving a primary example of the law when he says, “Clausius says that heat conduction is an irreversible process”. [Ibid]. He is not claiming that Clausius’s statement applies only to conduction. But keeping this prototypical example in mind while parsing the 2nd Law is VERY helpful. Now at this point it is worth mentioning that classical thermodynamics views all energy as being of three kinds: heat, work and “internal energy”, the only one of the three which is a function of thermodynamic state (1st law). So ‘work’ in the above must include not only raising and lowering of weights (the typical example in 19th century classical thermodynamics), but also moving particles in a field and making structural changes in things. After all, obviously there is a lot of energy coming in from the Sun, and on the average, very nearly all of it leaving — in lower entropy form, as Penrose so brilliantly points out in “The Road to Reality”. So there are the needed “compensating changes”. The advantage of this approach is that I have not had to go into ANY of the obscure technical details of radiation, emission and absorption. Neither did Rabett. All we really need from that is the understanding that radiative heat transfer IS a form of thermal contact, whose most startling, counter-intuitive difference from heat conduction is that the heater and the heated can be separated by icy cold space — with which there is NO thermal contact. The disadvantage, which I consider to be a VERY small one, is that neither have I shown that the 2nd Law is observed by ‘backradiation’. But that really is small, because I do not HAVE to show it: all I have to show is that G. & T. and all their ideological allies are outright WRONG to assert that backradiation DOES violate it. By NO means have they achieved what they claim, the ‘falsification’ of the greenhouse effect. on May 23, 2010 at 12:37 am | Reply Matt J.
Ooopsie! Even after carefully composing off line and double-checking, I missed this one: I got lower/higher entropy exactly backwards: what Penrose said was that the energy from the Sun TO the Earth is in lower entropy form — what leaves the Earth for space is in higher entropy form. This is, of course, mandated by the 2nd Law. Paging Maxwell’s demon… there are some cold photons which need to be rejected. The major part of the Halpern group criticism of G&T was the following interpretation. G&T are saying that long wave radiation leaving the colder surface cannot be absorber by the warmer surface. They make a great fuss about how ridiculous such a statement is, they blogged each other prior to the publication,each trying to outdo the other with invective about the stupid physicists Gerlich and Tscheuschner. How does a photon know where to go they will say with mock astonishment! Because they have either misunderstood or deliberately twisted reality they tiltied at windmills of their own creation. A colder surface can radiate to a warmer surface but the warmer surface will radiate more to the colder surface. The difference in the two fluxes is what we call heat and it always moves from a higher temperature to a lower temperature. They may also stress the contribution of conduction and convection as methods of heat transfer. Many AGW advocates say that conduction of gases is so small that it can be ignored. G&T might also tackle the unphysical concept of “Radiant Balance”. All this is guess work on my behalf as I haven’t read the reply as yet. However if the Halpern Group having misunderstood the paper, stand corrected by the reply; then the would rise in everyone’s estimation, if they made a sincere appology. on May 23, 2010 at 9:32 am | Reply Matt J.
I do not believe you, Brian, when you say that every “competent physicist” will agree with the statement, “that heat does not travel of its own accord from a colder atmosphere to a warmer planet”. “Of its own accord” is far too vague a statement. If by that, you mean the same thing Kubo meant in his description of Clausius’s form of the 2nd Law by ‘spontaneous’, then you would be right, but then your very next sentence would be a whopper of a non sequitur: for it is NOT ‘spontaneous’, there are plenty of compensating changes to allow for heat transfer from warm planet to cold atmosphere and vice versa w/o violating the 2nd Law of Thermodynamics. So those who deny this are the ones who have to bear the burden of proof. ‘Scienceofdoom’ and many others have already shown how badly they bore that burden — especially since G. & T. could not even state the 2nd Law correctly. I can’t believe some of the responses I see on this blog. People, if you do not understand the facts, you are not allowed to make your own up. Absorption and radiation from surfaces and gases are well understood physics. scienceofdoom has explained the topic well as reasonably possible. There is often confusion in understanding when intuition is used to replace technical understanding. If you look at energy transmitted as photons of particular energy per photon (which is equivalent to a particular wavelength) and materials as having electronic states (molecular vibration or rotation levels or solids with phonon states) that can absorb or emit photons of certain specific energy level, the whole process make sense. Waving your hands and concentrating on definitions of words can lead you astray. on May 23, 2010 at 5:15 pm | Reply Matt J. Getting the definitions right, stating the fundamental principles such as the 2nd Law of Thermodynamics correctly IS a crucial part of that technical understanding. Without that, even if one does have the understanding of photons and electronics states you mention, one can come up with the wrong conclusion. G. & T. did not get this right. It is one of the easier to spot of their many errors. That’s it! No consideration of the “compensating changes” ..
Could you please give a page number from the Gerlich and Tscheuschner paper to back up your claim that G&T made this unbelievably truncated version of the second law. on May 23, 2010 at 5:47 pm | Reply Matt J. That request sounds like a quibble to me. And if you are going to quibble, I will quibble right back: who told you it was MY claim? It is Rabbett’s claim, not mine. To find the exact place where G&T do this, I would have to do exactly the same work you would have to do: click on the link and start reading. – A heat transfer from a cooler body into a warmer one cannot happen without compensation. More interestingly whereas they criticise other people’s use of the law they do not actually seem to say that either the GH effect or backradiation are violations. I am not sure why they chose to discuss heat flows from the stratosphere to the atmosphere (which includes the stratosphere). I am not sure what they are refuting. It certainly isn’t back radiation to the surface. On the other hand the Figure shows heat flow from the stratosphere to the surface. Are they implying that someone is implying that the GH effect is due to heat transfer from the stratosphere? I am a bit disappointed that they do not seem to make any specific claims about back radiation due the GH effect violating the 2nd Law. on May 23, 2010 at 9:59 pm | Reply Matt J.
I am certainly not used to thinking of entropy as “energy spreading” as this article espouses, but the more I read about it, the more I see the value of this concept. But I still have to take issue with the description of entropy as a “measure of the spreading of energy”. It is far from just ANY such measure: it is a very special measure, additive when you bring two systems into thermal contact, for example. Even when I am reading older presentation of Thermodynamics, the primary concept of entropy I keep returning to is what I got from Kittel’s “Thermal Physics” so long ago: the natural logarithm of the number of accessible states. Now that I have scanned the link you provided, I see that these definitions are not so different after all: if energy is ‘spreading’, it is because more accessible states are being occupied, probably because more are becoming accessible in the first place. You simply cannot make assertions without evidence and then expect to be taken seriously. ….”To find the exact place where G&T do this, I would have to do exactly the same work you would have to do: click on the link and start reading.”….. The reason I asked you for a page number is I’m pretty sure your claim does not exist. G&T Version 4 is freely available to download. If you are simply repeating someone else’s assertions that is almost as bad. …. who told you it was MY claim? It is Rabbett’s claim, not mine…….. In case any reader is in any doubt Halpern= Rabbett. on May 23, 2010 at 10:20 pm | Reply Matt J. But I did state my evidence. You are simply inventing excuses for disregarding it and “moving the goalpost” by asking for more than is really necessary. So no matter which of their incorrect statements of the Law they follow, they are blatantly wrong. It really is that simple. But speaking of “making assertions without evidence”, where is YOUR evidence for the assertion that “Rabett = Halpern”? Eli Rabett and David Halpern are obviously two different people. Since you just told me I cannot expect to be taken seriously should I quote w/o evidence, we may now assume that you do not wish to be taken seriously yourself. Don’t be too surprised if your wish is eagerly granted. I can not see what is ironic about it, I merely convey what G&T quote as the law. Yes I would agree at times we would all like more explicit statements from them. Another problem is they seem to be quite remote from the comment surrounding their paper. on May 23, 2010 at 11:28 pm | Reply Matt J.
I find it somewhat delightfully refreshing that I can see so much agreement on this point. But surely this is one of many reasons why the G&T paper should simply never have been accepted for publication by a peer-reviewed journal. This is a rather long post, but is relevant to the Second Law. 2. Increasing “height” of emissions from CO2, the temperature at that new height now being a little warmer than it was before the increase. Smarter brains than mine have calculated that the effect is an increase of 3.7W/m^2 in “Radiative Forcing” (ie downwards energy flux at the Tropopause), and without feedback effects the temperature increase AT THE SURFACE will be around 1DegC. I have a problem with that scenario. The Surface sensitivity to changes in “Surface Forcing” is between 0.095 and 0.15W/m^2. This means that to MAINTAIN a 1DegC increase at the surface, the Tropopausal change of 3.7W/m^2 in “Radiative Forcing” must be amplified to between 7 and 11W/m^2 of “Surface Forcing”(no feedbacks) or between 22 and 32W/m^2 for a 3DegC increase (ie with IPCC style feedbacks). This difficulty is compounded when I think about the energy flows through the atmosphere. The Surface doesn’t care if the outer atmosphere has an energy imbalance. Unless the outer atmosphere can communicate that imbalance to the Surface, then the Surface just goes on with its business as usual, and what happens is that the unbalanced portions of the upper atmosphere warm or cool until balance is restored. And that’s all that happens. A “Constant Lapse Rate” argument doesn’t fill the thermodynamic requirement for energy balance: the outer atmosphere cannot drag the Surface temperature upwards. For the Surface temperature to change, there must be a change in the Surface energy balance – ie the “back radiation” or the solar insolation must change. When we discuss Surface temperatures, it is not Tropopausal energy balance changes which are important, but SURFACE energy balance changes. Tropopausal energy imbalance drivers the temperature of the tropopause, not the temperature of the Surface. Would you please cite a reference for your figure of 0.095 to 0.15 K m2/W. Assuming a surface emissivity of 0.98, the first derivative of the Stefan-Boltzman equation at 288.2 K gives a sensitivity of 0.19 K m2/W or 5.3 W/m2 forcing at the surface for a 1 K increase. A quick MODTRAN calculation also shows for doubling CO2 from 287 ppmv to 574 ppmv and adjusting the surface temperature offset to 0.88 K to produce constant Iout at the top of the atmosphere at constant water vapor pressure produces a change in the downwelling IR radiation of 5.966 W/m2 at the surface. That’s larger than the increase in radiation from the surface (4.396 W/m2) so some additional heat transfer from the surface to the atmosphere is built in by the assumption of a constant lapse rate. The numbers all get bigger if constant relative humidity is assumed. If 91% of the suns energy is at wavelengths below 2um, that leaves 9% that as far as I can tell no AGW analyzer is concerned with. What effect does this 9% have on the earth? 9% of the Suns radiation must have some effect. Similarly (or maybe it is covered by the answer to the above), why is there no concern with the radiation given off by the Sun in the radio spectrum? I have seen metal welded together by RFH (radio frequency heating). There must be some effect. Any ham radio operator will tell you that there are drastic differences in the amount depending upon where you are in the solar sunspot cycle. I have seen readings of several microvolts from a 50 ft wire. I have even made a radio that operates off of this random radio energy. Spread across the entire half of the earth facing the sun that is a tremendous amount of energy. The fact that radiowaves are dissipated (attenuated) through the atmosphere makes me believe that the energy is being absorbed by the atmosphere, thus causing heating. At times, the radio frequency noise from Jupiter has wiped out the 10 meter band. Or is there some law that says molecules can absorb/slowdown radiowaves and not gain energy? Also, If there are almost an infinite number of stars and each of these stars give the earth enough energy that we can see (hear) them (thus greater than zero), and I was taught that infinity times even the smallest number equals infinity, so, why doesn’t these stars also warm the earth (to some extent)? on May 24, 2010 at 3:33 am | Reply Matt J. Because most of that radiation at short wavelengths really is concentrated near the yellow band. Take a look at any of the curves for the sun’s output for for any other blackbody radiation source at around that temperature. Furthermore, much of what it shorter wavelength than visible is blocked by either the Van Allen belts or by the ozone layer. So not much heating from that. As for radio wavelengths, they don’t heat efficiently anyway. Not to mention again: much of that is reflected. So again, not much heating from them. I know this is all hand wavy, I have not done the calculations. So I too would look forward to someone supplying those details. Look up “Olbers’ paradox” It might not resolve your query but it is interesting in its own right. “I use the K&T diagram from their 1997 paper, which is the one published in IPCC AR4 WG1 Chapter 1. Similar calculations can be done with later verdions of their diagram. Figures in brackets are W/m^2. I think the error in his numbers is due to the surface’s big wild card – evaporation. Without it you get about 0.2DegC/W/m^2, as he correctly calculates. But with it you get between 0.095 and 0.15DegC/W/m^2. Feedbacks, mostly based on increased Water Vapour (and cloud cover) are cited by some climate modellers as the cause of the massive 3DegC response to the tiny forcing of 3.7W/m^2 caused by a doubling of CO2. The change in “radiative forcing” of 3.7W/m^2 (due to a doubling of CO2) produces a change in “surface forcing” of between 22 to 32W/m^2, required to maintain the claimed 3DegC increase in surface temperature. There is clearly something wrong with the consensus IPCC position. Climate model programs are no further forward than the were 10 years ago. Increasingly hard to accept magnitudes are given to entities like the so called back radiation. If the focus contained something like a 2cm2 by 5cm cylinder we would have 300,000W/m3 energy density. Since as SoDs diagrams show plenty of 15um infra red we should see obvious dramatic physical effects. The back-radiation is pretty diffuse, focussing it doesn’t achieve all that much. If you try and see it from the point of view of the collector, without a mirror it sees diffuse energy coming from all directions, with the mirror it still sees diffuse energy coming in from all directions. Basically the most you can acheive with any focussing system is to make all lines of sight converging on the collector from the focussing device as bright as the brightest source. In the case of direct sunlight, you can make one hemisphere (radiating up from the mirror), all to be as bright as the sun, with a diffuse source all directions will still look pretty much the same. I hope this helps, if it is not clear enough, I will try a bit harder, but basically you have to forget the intuitive idea that curved mirrors concentrate energy, but rather consider that they take a bright source and make it appear to the collector to be coming in from more directions, (from a bigger solid angle). As a matter of optics, you can’t use a parabolic mirror to concentrate downwelling IR, because it is nothing like a parallel beam, unlike sunlight. Put another way, seen from its focus, a parabolic mirror magnifies part of the sky. If that includes the sun, it gets very hot. But there are no such hot spots in the IR firmament. A mirror can’t produce a higher temp than the emitting surface that it focusses – that’s real 2nd law. So a solar furnace can theoretically reach about 5700 K, but no hotter. But an atmospheric IR furnace couldn’t get hotter than the atmosphere. This unmasking is now common knowledge on the various interested websites. Err…Eli Rabett is JB Halpern, not David Halpern. As to the ‘unmasking’ – he could have chosen to keep his name off the paper, but did not. He revealed himself, he was not ‘unmasked’. Good reply thanks, I was forgetting that the solar radiation is nearly parallel hence easily focused. However it does not seem beyond the bounds of the laws of reflection that some focusing is possible. That this does not seem to have been done seems odd. The best you can hope to achieve is that the collector “sees” radiation coming from the focussing device (mirror, lens) to be as bright (and to have the same radiative temperature) as the brightest part of the incoming radiation. Now, here is some bad news, the collector in order to produce a power output, must incorprorate a heat engine of some sort. So is limited to its Carnot efficiency. Ta = source temperture Tb = sink temperature. Now it may not be obvious that something like a PV cell is a heat engine (but it is) and requires a heat sink (but it does) and its heat sink is normally just its local ambient environment. But whatever the engine it will be limited by the standard constraints. Now, when looking up you are looking at radiation from the atmosphere which is normally only warmer (temperature gradient inverted) than the ground during the night. But even so it is only a few degrees warmer. The Carnot efficiency is thus very small and the useful power output is very small. Now, were it possible to “concentrate” a diffuse radiation field then you would be up against the 2nd Law and entering the realm of perpetuum mobile. You would be able to extract both work from the atmosphere and transfer heat to the collector’s environment even when the source of the radiation (the atmosphere) was cooler than the collector. Now I highlighted, PV cells, because I thought someone might think that they simply convert radiant energy into useful work (via say a connected motor), and be a bit of a one way street for captured photons. But this is not the case. If people do not trust me, I will find a thermodynamic treatment of photovoltaics (but they are I think, rare, and not easy reads). All in all, this inability, to create work from the very real back-radiation (unless we can disipate the waste heat to an environment that is cooller than the atmosphere), brings us right back on topic. Provided the back-radiation comes from a cooler atmosphere (the source) and impinges on a warmer ground surface (the sink) no heat engine that produces work could be constructed that did not violate the 2nd Law, and any such engine would able to defy the law in many contexts. I was simply picking the point where the properties of snow changed. That’s the only significance of 2um. In fact, solar absorption is fully considered in climate models, and climate models don’t “assume” that solar radiation stops at 2um. I have never come across an explicit statement saying just that! Despite the radiation containing lots of 15um radiation the atmospheric back radiation cannot increase the temperature of the surface above that of the atmosphere! I hope scienceofdoom is reading this. I have posted another reply above that overlapped with Nick’s (I am a very slow writer!) that says much the same. The inability to change the temperature, is I think universally true, even if one only has a very small bit of the spectrum available. By this I mean, even if a gas only emitted in a band at the upper frequency end of its Black Body curve, the maximum attainable collector temperature is still just the source temperature. If it only radiated from a band at the lower end of its curve it would still have the same attainable temperature. If you put narrow band source of thermal radiation at one focus of a 3d ellipse and a collector at the other focus the collector would equillibriate at the temperature of the source irrespctive of the frequency of the band. Acutally, and more generally, put a monochromatic thermal source and a collector anywhere inside an isolated cavity, and provided that at least one other element was capable of absorbing at that frequency, the whole lot, collector and cavity would equlibriate at the source temperature. on May 24, 2010 at 4:27 pm | Reply Matt J. The catch being, of course, that it was asserted as “real 2nd law”, but no proof was given, nor was a reference. I would expect it to hold true only under the conditions of unspoken assumptions, assumptions that do not turn out to be relevant for the case at hand, the earth and the atmosphere, sort of like “monochromatic thermal source”. I do not think it is difficult to see that if by any mechanism the radiation from a source could be channelled in such a way that it produced a temperature higher than that of the source the following would have taking place for a collector as it warmed to this higher temperature. To gain this higher temperature the production of entropy once T2 = T1 must be negetive. Matt, the thermodynamic reasoning is simple. If you could focus EM from a source onto a sphere, say, which was raised to a higher temp than the source, then as a matter of optics, that sphere would radiate back along the same ray paths, returning more heat to the source than it received. on May 24, 2010 at 10:53 pm Matt J. How so? If I focus it on the sphere, more likely than not, I have it focused on only one small part of the sphere. But the heated sphere’s blackbody radiation is in all directions, NOT “radiated back along the same ray paths”. You seem to be assuming that the optics for all rays in the scenario are the same. They certainly need not be, especially in the scenario we are REALLY interested in, that of “longwave” radiation, where a small change in wavelength makes a huge change in absorptivity by CO2. As S of D has often pointed out, the photon does not know where it came from. It cannot say to the collector, “Sir, would you like to absorb this photon?”. The probability of absorption is determined by the collector’s absorptivity alone. Barrage the collector with enough photons, and the temperature will keep going up faster than blackbody radiation can take it away. I am just not seeing a reason the mirror cannot collect enough photons to raise a small collector to a very high temperature, not when there is such an abundance of high energy photons to focus; since they are such short wavelength, even the diffraction imposed limit does not seem to be enough. Matt, if the sphere is emitting in other directions that don’t get back to the source, that just exacerbates the energy discrepancy. The part of the sphere receiving radiation will, on its own, return more heat to the source than the mirror received. Another way to see it – a telescope just has the effect of bringing you apparently closer to the object. If it’s hot, you’ll get hotter. But you can’t get closer than the surface itself. on May 25, 2010 at 1:08 am Matt J. First, Nick, let me say, thanks for being so patient with this line of inquiry, but I am still not seeing how your conclusions could follow from your expressed premises. In particular, though I find your cavity comparison interesting, I am not yet convinced that that IS the best case. After all, if seeing each tile is like seeing the surface of the Sun, then seeing two of them should be like seeing the surface twice, carrying you twice the energy. But then what would stop you from considering as “best case” a cavity where each hot plate is showing you twice as much energy as in your scenario, so that you should become twice as hot? I could get this if, for example each of the hot plates in your example was in turn the reflection of two hot plates already. Finally, the well-known cavity result you describe is for equilibrium, which is not the case here, since energy IS being dumped into the system. …. comes to the same temperature, regardless of shape or emissivity. I have just been enjoying Perpetual Motion. That is perpetual motion that comes out of a bottle. Heat flows from me to the blanket, but the blanket still keeps me warm. That warmth did not originate from the blanket, the blanket does no work. Having drunk the perpatual motion, it is time for the blanket. The non-equilibrium issue with law is well known and understood, and IS taken account of in the radiation equations. (I checked Goody & Yung “Atmospheric Radiation”). The source function is derived using the Einstein Coefficients which are not dependent on equillibrium conditions. Also I am not sure what pointing out this issue is meant to achieve without indicating what difference it makes. There seems to me to be a lot of that practice in G&T. Now, FWIW, when the ground is not at the same temperature as the atmosphere, so is both not in radiative balance (and hence the surface is not in thermodynamic equilibrium) what is likely to happen to the absorptivity? The absorptivity is likely to go up. I cannot see how that would aid any argument regarding the ground somehow rejecting the back radiation. Further, I beleive all that is necessary is not an equality between emissivity and absorptivity, merely that a non zero value for one implies a non zero value for the other at each frequency and this is true irrespective of their being an equilibrium state, as it relies, like the radiative equations not on Kirchhoff but on Einstein. Believed by whom and on what grounds. Any increase in evaporation will increase the specific humidity which will increase the radiation from the atmosphere to the surface even more than from the temperature increase alone. That’s why water vapor is a first order positive feedback. As long as we’re into hand waving, I’ll contribute some too. Most of the latent heat transfer is in the tropics. The temperature in the tropics won’t change much according to calculations. So global average latent heat transfer is unlikely to change very much. I will take this at face value, and tell you where it leads me. Now consider the implications when the mechanisim that forms the chain from photon capture to starch production is reversible at each stage. That is, it has no inherent prefered direction. Why would it normally proceed in the direction of photon-makes-starch. Well, because the sun is hotter (at a higher temperature) than the plant cell. Would the production chain emit photons at the same frequencies as the incoming photons it captures? If one were to put the plant into a cavity and let it equilibriate, the rates of photon capture and photon emission would be the same. Although some (a very few) photons of the required frequency would be available at room temperature, net starch synthesis would not take place. The relationship between reversible microscopic processes and macroscopic outcomes interests me, and perhaps others. If I consider the case where some stage of the photon-makes-starch mechanism is inherently irreversible, has an implied direction; it would seem to conjure up the possibilty of a violation of the 2nd law. It would be a selective trap door which would scour its surroundings of suitable photons even if the mechanism were in thermal equilibrium with those surroundings. It seems that although it has proved difficult to show that reversible microscopic mechanisms give rise to irreversible macroscopic outcomes. I wonder if it has been more easily shown that irreversible microscopic mechanisms that preferentially selected quanta of certain energies would necessarily imply a violation of the 2nd law. Must the plant also emit photons of the same energy? Always simultaneously emit a photon of the same energy? It will emit photons according to its temperature and effective emissivity, and perhaps sometimes as a direct result of having captured a photon and not yet passed it down the chain. Hopefully I have been of help. on May 24, 2010 at 8:25 pm | Reply Matt J. 1) the 2nd Law of Thermodynamics gives us dS = d’Q/T, but it does not give us S = Q/T except in special circumstances, such as isothermic reversible processes. I am not convinced this is one of those special processes. Can you provide an argument justifying this step? 2) Again, just as the G&T paper failed to do, one must track ALL the heat flows and ALL the entropy flows, not just in one direction along one path. After all, in reality, the collector will start radiating itself, and in this way, it loses both heat and entropy. Why, since at first, the collector may be assumed to be cooler, it will even radiate in lower IR, and therefore at a higher entropy per unit energy. But if it loses entropy ‘more efficiently’ then it does heat, then your equations are not justified, and there is no mysterious loss of entropy: just more spreading of it, which is perfectly compatible with the 2nd Law. 3) Interesting that you do not even reference the fact that it is radiated heat. But then your argument should be equally relevant to scenarios where radiation is not even involved, such as adiabatic compression. But adiabatic compression easily achieves higher temperatures than any of the surrounding objects, as anyone who has burned himself on a bicycle tire valve knows too well. For that matter, are you assuming both radiative heat source and collector are blackbodies? If you measure the evaporation from a reservoir, there is more evaporation on a hot day than a cold day. This is uncontroversial. If the temperature increases at all in any part of the world, evaporation will increase, whether or not it is in the tropics or in the polar seas. I think I made plain that I was using the model by Kiehl and Trenberth, which describes a purely ficticious “average” planet, which has a surface temperature of 15DegC, is bathed in average sunlight, with average cloud and average rain, and average evaporation, 100% of the time. One may quibble with this, but what would such a diagram look like at 18DegC? And what would be the implied Surface sensitivity? The main feedbacks claimed by some modellers are based on increased water vapour in the atmosphere. I don’t know how much evaporation is assumed by these modellers, but Gavin Schmidt has claimed an increase of around the CC levels. I suspect the levels of evaporation change vary between the models, but they are all likely to be on the high side – high evaporation is needed for significantly more water vapour for a decent amount of feedback so the temperature change can be alarmingly high. If you have high evaporation you have lots of feedback but very low surface sensitivity. On the other hand if you have low evaporation you have higher sensitivity but no feedback. But my main point, apart from the exposed imbalance at the surface for a 3DegC temperature rise, is that a “Constant Lapse Rate” is no argument for a surface temperature rise: the lapse rate is not a mechanism for warming the surface – that would be a violation of either the First or Second Laws. The ONLY way a Surface temperature increase can be maintained is if there is an increase in Surface Forcing. I have calculated, based on a peer-reviewed model (K&T), what the range of Surface sensitivity is, and therefore what increase in Surface Forcing is required to maintain the very large 3DegC temperature rise claimed to arise from a piddling average 3.7W/m^2 change in “Radiative Forcing”. DeWitt Payne quite rightly has pointed out that this relies on an assumption of evaporation. What rate of evaporation increase is assumed by the modellers? I understand a stronger positive feedback (like the net water vapour one is) means a higher climate sensitivity. I think you meant something else, though. What is it? I started posting about this subject because many people had questions or were confused about the basics. This specific post was inspired by Bryan’s final response to specific questions – about how a hot body could choose to not absorb radiation from a cold body. He hasn’t actually addressed those specific points so I don’t feel the need to make further comment – and the reason for this comment is to see if any silent readers have questions that they don’t feel have been addressed. It’s fine to have questions and it’s fine to be confused about the intricacies of this subject..
Well, I thought my comment on May 22nd on how the Imaginary Second Law would modify the light curves from Eclipsing Binary Stars was pertinent. Whilst it was not a question, comments would be welcome. I have been quite clear on the point that a colder body can radiate to a warmer body. When the radiation gets there it can do three things. It all depends on the material. I think that you believe it will heat the body but you will not commit yourself to say so explicitly. You pointed to the abundant quantities of 15um infra red in backradiation to support your position. I tried to come up with an explanation of how this radiation could be absorbed and yet show no heating effect. – it was not easy. I gave an answer that radiation centred around the lower temperature from the colder object would find the radiation from the hotter object streaming out at a higher rate. I was not particularly satisfied with my own answer. So I reversed the burden of proof back to believers in AGW to show why at night 300W/m2 backradiation focused by a one square metre area parabolic mirror would not show dramatic physical effects. I had two excellent replies from Alexander Harvey and Nick Stokes. 1. Backradiation is diffuse and cannot easily be focused which I should have remembered. 2. More importantly a source cannot increase the temperature higher than its own temperature. So the night sky at say -20C cannot raise the temperature of the surface to more than -20C. I feel that this explanation is much better than the one I was fumbling about with. on May 25, 2010 at 11:42 pm | Reply Matt J. Well, Bryan, since you are addressing S of D, I will leave all the details of a full reply to him, but I cannot help but point out: what you seem to think was a good reply to him is obviously just an evasion, “it all depends”. “1. Backradiation is diffuse and cannot easily be focused which I should have remembered. 1 is true, but not relevant. 2 looks better, but it still not relevant, since in that scenario, the source is the ONLY source of energy; but that is manifestly not the case when the atmosphere returns some heat back to Earth. To be more expliciit, using the very example you mention: the night sky at -20C is NOT raising the temperature “to more than -20C”: it is the Earth’s own heat reservoir (you did say night sky), PLUS that small bit of heat from the night sky that is raising it to “more than -20C”. Remember the example of the man in the Arctic with a blanket, and it should all become clear: the blanket is not what raises his temperature to 37C, his own metabolism does that; the blanket simply lowers the rate at which he LOSES heat. Similarly, ultimately, it is the Sun that raises the Earth’s surface temperature to comfortable 15-25C. But direct insolation does not do this alone, it it direct insolation PLUS solar energy stored in the atmosophere returned to Earth by longwave radiation. This leaves me wondering if Trenberth et al. could have avoided this whole misadventure by refraining from using average numbers, analyzing day and night scenarios separately. But they did not, we deal with what we have. Does a blanket have a higher temperature than yourself? Does a blanket cause your body to warm up to some extent? The blanket is a good analogy. The atmosphere act like an insulator(blanket) delaying heat loss from the surface. Its not like an electric blanket however. No, it´s not like an electric blanket. It´s passive, and that´s what makes it a good analogy here. But even being passive, the blanket has a temperature, tipically room temperature (before you use it, at least). It emits radiation according to that temperature, and it has some effect on your body temperature, even if the blanket´s temperature is lower – much linke the atmosphere and the planet´s surface. Remember it´s an analogy, so it has its limits. But it might be helpful. I don’t think you can claim clarity on the point about what happens to radiation when it reaches a warmer body. Here is your chance to be clear. 1. When 10um radiation from a -10’C body reaches a 0’C surface how much of this 10um radiation is absorbed compared with the scenario of 10um radiation from a +10’C body. Dependent on the answer we can move to the next step. When you cover yourself with the blanket you will increase its temperature. The inner blanket will perhaps be just short of your skin temperature . It will radiate back to your body but the flux from your body will be greater so heat will flow from body to blanket to surroundings. Don’t forget the conductive and convective properties you would like in a blanket. on May 25, 2010 at 10:43 pm | Reply Matt J. You do realize, I hope, that you have just undercut your own opposition to the claim that back radiation cannot cause a “greenhouse effect”? After all, you just explained why wrapping a cold person with a blanket makes him warmer, even thought the blanket temeprature ls lower than the person’s temperature. But leaving aside the specifics of HOW the heat is transported, this is a very good analogy for how GHGs in the atmosphere raise the surface temperature of the earth. Note tha both cases work precisely because they are steady-state, NOT thermal equilibria. Energy is being poured into the one system from digestion of food and/or metabolism of ATP, into the other by nuclear fusion. Just short, but less. Necessarily. Even so, it has an effect on your body temperature. That’s where the analogy drifts away. Anyway, it’s good enough to show that a body with a lower temperature can have an effect. We could also think of a radiator with different heat conductivities (again, it’s an analogy that involves conduction. Limited analogy, as always). The radiator always has a lower temperature. But change the heat flow through the system in some way, and you’ll change the temperature of the source. Same goes to the surface losing energy to space through the atmosphere. Interestingly the “radiator” should really be called a “convector” as that is its main method of heat transfer. I think the “climate sensitivity” is the change in Surface air temperature for a given change in “Radiative Forcing” (which is defined as the increase in downward flux at the Tropopause). The temperature of the air close to the surface (the “boundary layer”) is closely bound to the temperature of the surface. So the “climate sensitivity” is the same as the “Surface sensitivity”. The change of evaporation with temperature is central to the sensitivity of the Surface, so yes I am saying that high evaporation means lower sensitivity, and vice-versa. I don’t agree with that. I just did an experiment. It’s quite a cold day today. I turned my face upwards and brought my hands close to (but not touching) my face. I could feel the heat from my hands on my face. I think this is unlikely to be through direct conduction, nor convection – the effect is instantaneous. Which leaves Radiation. Further, on many radiators the radiation is focussed by a parabolic reflector, which makes no sense if the main transfer in convective. Finally, the heat from a radiator very rapidly diminishes with distance. I think this is due to CO2 and H2O absorption, as well as the square law dissipation. …….You seem to think was a good reply to him is obviously just an evasion, “it all depends”……. about radiation arriving at a surface? I would have thought I was just stating the “bleedin obvious”. on May 26, 2010 at 5:46 pm | Reply Matt J. So you claim you were merely stating “the bleedin’ obvious”, do you? No, you were not. 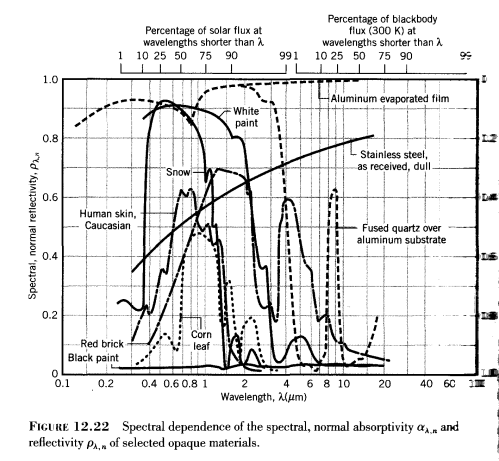 What really IS “the bleedin’ obvious” is that in the relevant wavelengths, ALL the surfaces you just named have rather high absorptivities, above 0.8. This is close enough to 1.0 for S of D’s argument to hold, and for yours to unravel. And it is just as obvious that when S of D posed the question to you, the contexts shows the he did not have just any surface in mind: he had in mind the surface of the Earth, which most certainly does have a high absorptivity in the relevant spectrum. S of D even gave numbers. But you have been dodging so long, even you have probably forgotten that he already did this. Finally, you are violating the Etiquette rules of this forum by using an adjective that is definitely considered obscene in British English — which seems to be the predominant variety of English in this forum. ….. When 10um radiation from a -10′C body reaches a 0′C surface how much of this 10um radiation is absorbed compared with the scenario of 10um radiation from a +10′C body……. Well again it depends on the surface. However I will anticipate your next reply and will postulate that the surface is highly absorbent. This complies with 2nd law and for further information take the matter up with Alexander Harvey and Nick Stokes. In actual fact, a quick check on google, says that the good collection of diffuse radiation will produce a result of 80% of source temperature. However the Earth surface has a high thermal capacity and the conduction convection and radiation heat losses from surface are such that the temperature is at 0C and falling very slowly, I guess. The net result is the atmosphere has practically no heating effect on the surface. The heating effect( if any) cannot be measured. Karl Popper would say if it cannot be measured it might as well not exist. I do not agree fully with Karl on the aspect of the possible existence of a non measurable effect. However he represents the current orthodox presentation of scientific philoshophy. When Alexandre mentioned a “radiator” I was assuming he was referring to a water filled central heating “radiator” common in the UK. Its main method of heat transfer is convection. Of course a radiating electric element situated at the focus of a polished reflector will transmit significantly more heat transfer by radiation. Actually, I was thinkng of some general heat radiator, either a car or a transistor radiator (I have a background in Electronics). I´m not very familiar with the common usage of words, since English is not my first language. So convection is not the main issue here. It´s heat transfer, and how some change in the colder body, or some change in the flux inbetween, can affect the temperature of the hotter one. Bryan: “However the Earth surface has a high thermal capacity and the conduction convection and radiation heat losses from surface are such that the temperature is at 0C and falling very slowly, I guess. Actually the ground would cool pretty rapidly at night (remember T^4) if it wasn’t for the atmosphere. It actually does still cool relatively quickly (compared to the air above it). But anyway, that the atmosphere ‘acts as a good insulating layer’ is basically what the greenhouse effect is about, so we’re all happy, are we not? As for measuring the “heating effect”: this can be done and has been done, of course. Ground temperatures are measured all the time, air temperatures close to the ground are measured all the time and radiation at the ground is also measured all the time (for weather forecasting if for nothing else). Energy-fluxes within the ground have also been measured. People look at the differences in those temperature measurements, depending on cloudiness, composition of air, etc. You can also compare this with theoretical values of what the temperature should be and you have your “heating effect”. I think I just don’t understand what the remaining problem here is. So let’s make it even clearer so there is no possible confusion. Suppose the absorptivity of the surface at 10um is 0.8. We can assume this is the absorptivity of the surface for the incident radiation (at 10um) from the +10’C body. 1a. What is the absorptivity of the surface for incident radiation (at 10um) from the -10’C body? on May 26, 2010 at 5:12 pm | Reply Matt J. So many errors to correct, so little time! But how did you miss it? That IS the point! The Earth’s atmosphere acts as a good insulating layer, with the effect of raising the average surface temperature by over 15C so that life as we know it is possible. It acts as this “good insulating layer”, specifically because of the CO2 (with smaller contributions due to other GHGs) causing the famous “backradiation”. What pseudo-logical sleight-of-hand it is for you to admit the presence of this “good insulating layer’ and yet deny that that is a heating effect on the surface! But I suppose I should expect that out of someone naive enough to cite Popper as “the current orthodox presentation of scientific philoshophy”. Popper does represent a very popular trend, but with all the justified criticism his notion of ‘falsifiability’ has come under, you are certainly going too far to call him the representative of some fictional “current orthodoxy”. Alexander Harvey and Nick Stokes have said that even if I collected more than the 300W/m2 the best I can hope for is the temperature of the source i.e. -10C. The radiative effect of the atmosphere and the temperature of boundary layer will also effect conduction across the boundary layer. This in turn will determine convective losses and perhaps phase change might also be involved. The higher the temperature of the atmosphere the smaller will be the heat loss of the surface. All three methods of heat transfer show heat travelling from the hot surface to the colder atmosphere. The “radiation frost” phenomenon shows that when the odd occasion arises that the atmosphere is hotter than the surface the heat capacity of the atmosphere is insufficient to stop the radiative loss of the surface. However I think we are all in agreement that the atmosphere provides a very welcome insulating layer and without its thermal properties human life would perhaps be impossible on Earth. Good question. I’d like to know the answer to that as well. In fact, I’d really like to see an energy balance a la Kiehl et al for the planet with doubled CO2 and a surface temperature increase of 3 K. Unfortunately, I don’t know any modelers. …”So many errors to correct, so little time!”…..
…..”It acts as this “good insulating layer”, specifically because of the CO2 (with smaller contributions due to other GHGs) causing the famous “backradiation”……. Perhaps you would like to start with the statement above. Hint boils at 100C at one atmosphere. Why not actually answer the question? We can assume this is the absorptivity of the surface for the incident radiation (at 10um) from the +10′C body. 1a. What is the absorptivity of the surface for incident radiation (at 10um) from the -10′C body? It’s not like I am throwing a new question at you. on May 27, 2010 at 2:28 am | Reply Matt J. In a way, I am sure he did think he answered it in the words, “think a lot of this radiation is in fact scattered from the hot surface and is not absorbed”. The real problem is that the answer is both completely unsupported and completely implausible. Didn’t you already give some numbers for absorptivity of the Earth’s surfaces in this range of IR? You would be able to find them more quickly and easily than I. But I seem to recall that the 0.8 you proposed considering really was conservatively based on typical absorptivities for this range of IR. Which in turn means that 80% of the incident IR is absorbed, NOT scattered. But as if this wasn’t enough to destroy his credibility, now he is trying to cast doubt even on Kirchhoff’s law, the same kind of tactic Creationists use to keep coming up with excuses for denying Evolution. For this reason,I further say that his answer is completely implausible. The point is not to pick a particular value which represents the earth’s surface. Most surfaces are around 0.97-1.00. The point is simply to compare two scenarios (without having to argue about the measurement conditions and experimental setup for that value). If the absorptivity = x for wavelength y with the surface at temperature T, then it will be the same for radiation of wavelength y from any source. Bryan can see that if he agrees to this it will cause further disruption to the imaginary second law of thermodynamics, as the only way to “hold it together” in that case will be to start claiming the first law of thermodynamics doesn’t apply. Not pleasant. And he can see that if he doesn’t agree to it then he will look like he is making it all up as he goes along. Not pleasant either. Therefore, mostly Bryan has been ignoring it or giving vague answers that can be retracted later. You would like me to say that they are both exactly the same. 2. Kirchhoff’s Law itself appears to be questioned. So I will stay agnostic on this one till further evidence clarifies the position. But just in case this is not the point you are trying to make lets say they are equal +or – 20% then go back to my previous answer. on May 27, 2010 at 2:08 am | Reply Matt J. Yes, Kirchhoff’s law is being questioned. But not scientifically. When a photon encounters a molecule, the molecule doesn’t care about the origin of that photon. All it sees is a photon with a precise energy content determined by the frequency of the photon. Whether or not the photon is absorbed depends on the energy state of the molecule, its propensity to vibrate, its velocity(doppler) etc. The probability of the photon being absorbed by a particular species or ensemble is what we know as absorptivity. 1. Whether the photon is from a cold body or the sun doesn’t matter. (The absorbing species has no knowledge of, or interest in, the origin). 2. Absorption is purely a matter of the frequency of the photon and the temperature, density and species of the absorber. 3. The same PROPORTION of same-frequency photons will be absorbed whether they originate from the sun or an ice-cap. on May 27, 2010 at 2:07 am | Reply Matt J. But then what about relaxation time? If the photon is absorbed, but then immediately re-emitted, or another photon of any energy emitted because of collision with another molecule, then that affects the ensemble average, which is what determines the macrosopic, thermodynamic quantities — as well as the emitted spectrum. I would like to thank DeWitt Payne for his contributions, which I have found to be thought provoking (always most useful) and helpful. In this case I agree with him. Evaporation is the major heat transfer mechanism from the surface to the Atmosphere, accounting for at least 3/5ths of the energy. It is also the least understood. It results in a much reduced Surface sensitivity to “Surface forcing”. It also has a major role in the very poorly understood feedbacks. Obviously more evaporation = more clouds. But how much, and what are the effects? Also more evaporation may mean more water vapour – which could mean more back radiation but also means more release of latent heat in the clouds. Do cosmic ray intensities also affect clouds? These matters are all far from “settled science”, but are matters of intense debate, a debate which I see as a positive thing. on May 27, 2010 at 1:58 am | Reply Matt J. At first glance, this sounds all scientific and objective, but the appearance does not survive closer scrutiny. Make up your mind: which will it be? Either we still do not KNOW how much it reduced surface sensitivity, or the relevant part of the debate IS settled. No, I just wanted a straight answer. Of course, I can see why you don’t want to give it.. Your use of red herrings and incorrectly applied concepts to defend the imaginary second law of thermodynamics is commendable. Kirchhoff’s law has nothing to do with it. Kirchhoff’s law is about the equivalence of absorptivity and emissivity under certain conditions. I know that since you found this you have been using it as your “Get of Jail Free” card but it can’t be used in this case. (As a side note it’s quite easy to tighten up the experiment definition so that Kirchhoff’s law does apply. But it’s thankfully irrevelevant here). I am asking about the absorptivity of a surface at one wavelength. And how that absorptivity changes for radiation from two different bodies. The surface is at 0’C in both cases. You appear to claim that the absorptivity is not 0.8 at a wavelength of 10um when the 10um radiation has been emitted by a -10’C body. And you think that is correct for false reasons. How does the magic happen in this surface? How can it have different material properties at the same temperature and the same wavelength because of the temperature of the source? – 10um radiation is 10um radiation, there are no “meta descriptions” attached. Probably you can see what’s at the end of the road here. I’m sure everyone else can who has made it this far.. This was in response to my statement that absorption has nothing to do with the origin of a photon. The re-emission of a photon can take place before thermalisation, but the rate is in general very very small (eg in the lower atmosphere the probability is less than 10^-5, as the time available is less than a nanosecond). There is a chance of emission of another photon of the same frequency from the thermalised ensemble – that is a function of density, composition and temperature. I agree that it would be difficult to seperate whether an emitted photon is perchance a reflected photon. I am having difficulty understanding whether Matt J is agreeing with my statement or disagreeing with it. Perhaps he could expand his argument? “At first glance, this sounds all scientific and objective, but the appearance does not survive closer scrutiny. For the basis of my claim that evaporation results in a much reduced Surface sensitivity to “Surface Forcing” I refer Matt J to my post at 0823, 24MAY. For discussion of the uncertainty, see the subsequent discussions between myself and DeWitt Payne (see 1552, 24MAY and 1200, 25MAY). I hope that answers Matt J’s question more fully. Matt J is correct in that there is very large uncertainty in the rate of change of evaporation with temperature, which I identified as 2.5 to 6.5% per DegC. In either case the Surface sensitivity is reduced from the Stephan-Boltzmann number of about 0.2DegC/W/m^2 to between 0.095 to 0.15DegC/W/m^2. The two photons would have equal chances of being absorbed of course. I do not know where you are going with these self evident almost pointless comments. I think that it is because you subscribe to the Halpern interpretation of the Gerlich and Tscheuschner (2009) paper. Before their paper there were several versions of the “Greenhouse Effect” at least twelve I believe. People were very free and easy about language in particular the description of infra red radiation. Sometimes it was called thermal radiation,sometimes infra red radiation.sometimes heat radiation or even simply heat. In this confusion of descriptions some people formed the idea that because G&T said “no heat can move from a cold atmosphere to a warmer surface” they meant no radiation could move from a cold to a hot surface. I was surprised by this interpretation any reread the paper to see if there was any justification for this view, I found none. However it formed the major thrust of the comment of the Halpern Group. Now at the time G&T could easily have cleared up the misunderstanding but they didn’t. Gerhard and Ralf must have noticed that Halpern and friends were off in a completely wrong direction. But since Rabbit and co were not very nice then why should G&T help them. The events took on a comic turn when some defenders of G&T accepted the Halpern interpretation and each side went at it hammer and tongs. I pointed out to Joel Shore in a WUWT encounter back in early March that they had an unreasonable interpretation on this point. All G&T had to do in their reply to the comment is to ask the Halpern Group to point out which part of the G&T paper they were referring to! So then scienceofdoom which part of the G&T paper (page number please) states that radiation from a colder surface cannot be absorbed by a warmer surface. I know where I am going with this..
And the points are self-evident to everyone else. I’m glad we now know that they are self-evident to you. From previous comments they were not. This is why I asked for clarification. Watch out for the next post explaining the implications of this. I think that it is because you subscribe to the Halpern interpretation of the Gerlich and Tscheuschner (2009) paper..
You can read what I wrote about the G and T paper. And everyone else can see from the few posts (links in the early part of this article) how resistant you have been to answering this most basic question. This is why I have pursued this topic. Well, watch out for the next post which will show the effect of radiation from a colder body on a hotter body. This forms the major criticism of G&T yet cannot be found in their paper. Since you write extensively on the errors of G&T this should be easy for you! Hard because it just isn’t there! on May 27, 2010 at 4:23 pm | Reply Matt J. How can you not know the answer to this question, Bryan? It has been discussed so many times in this forum. Why, diessoli just answered it AGAIN. Item 6 p92 is where they say it. That you could even ask this question is yet another proof that you have no interest in discussing the issue in a rational, scientific manner. You really do not belong in this forum. Man. I’ve just started to skim through G&T’s paper. How did they ever get this into a science journal? Actually, has anybody read the version published in the journal? Is it the same as the freely available version 4? They even have a screenshot from Al Gore’s movie, mention “realclimate.org” and give us a summary of a 1990’s Australian TV documentary. I did not expect much, but this is soo bad, I am amazed. Argh. they even bring the we-can’t-predict-the-weather-more-than-a-few-day-so-how-can-we-predict-the-climate talking point. How did you manage to actually read all this, SofD? Taking out the reflection (as not relevant here) the statement becomes. I fail to see where this says that colder surfaces cannot radiate to warmer surfaces. What it does say is it cannot heat them up. I did write extensively, so you should be able to comment on the things I actually wrote. Well you have already made 17 comments on that article. Others who are interested can read your 17 comments and judge if you actually found any faults or points of interest. on May 27, 2010 at 4:17 pm | Reply Matt J.
I can’t speak for others, but nevertheless I am sure many others reached the same conclusion I did: that Bryan is eager to support the conclusion of the G&T paper, whether the science supports G&T or not. Furthermore, that Bryan never actually does support the conclusion of G&T based on scientific thinking, but only offers a thinly disguised imitation of it, dodging the real questions instead. The problem is that if you increase evaporation, you must also increase specific humidity. Increased specific humidity increases the forcing, otherwise known as water vapor feedback. For the 1976 standard atmosphere in MODTRAN, you can get a 3 K surface temperature increase from doubling CO2 (287 to 574 ppmv) by increasing the water vapor scale to 1.3. That works out to increasing the relative humidity at the surface from 45.8 to 59.6%. And yes, the increase in radiation from the atmosphere to the surface is 27 W/m2 (257.4 to 284.4 W/m2). I’m unsure what is meant by “increasing the water vapour scale” as this is a term I am unfamiliar with. But if RH increases from 45.8 to 59.6% while the temperature increases by 3DegC, then the amount of water vapour in the air (in g/kg) increases by a massive 56%. on May 27, 2010 at 11:14 pm | Reply Matt J. How would we know? Often, we laymen do not notice an increase in relative humidity until either 1) people start dropping from heat stroke or 2) RH reaches 90% or more and it starts raining. Not everybody has an instinctive understanding of the old refrain, “It’s not the heat, it’s the humidity”. I think that an increase of 56% in Absolute Humidity for a temperature increase of 3DegC is not supportable. b. 7.5% increase in Evaporation and 2.5% increase in Relative Humidity. looks like most of them are near 1%/degree. I’m also not talking about a within day change in temperature of 3 C causing an increase in absolute humidity of over 50%. It’s a global average for a warmer planet. What you might see over the course of a century is an expansion of tropical and semi-tropical climate to higher latitudes and an increase in temperature at high latitudes at constant relative humidity resulting in an increase in global average humidity. DeWitt Payne in his post at 1515, 28MAY, now seems to be talking about Absolute Humidity, not Relative Humidity. I take it that DeWitt Payne agrees that the humidity increase that he applied in his Modtran exercise is far too excessive, and that if he applies the lower figures from his 28MAY post, he will not achieve an energy balance. I hope I have not taken his comment out of context: we were discussing wahat an updated 18DegC Surface temperature Kiehl&Trenberth diagram would look like (see IPCC AR4,WG1, Chapter 1, Fig FAQ1.1 for a 15DegC version) – ie an equilibrium, steady state. So no, I hope I am not confusing a steady state with transience. To maintain the Surface at an elevated temperature 3DegC warmer requires between 22 and 32W/m^2 of increased “forcing” (either insolation or back radiation). I thank DeWitt Payne for his post. 1. It is correct that Evaporation = Precipitation (Mist, frost, rain, hail, sleet, snow). 2. An increase of absolute humidity of over 50% for a 3DegC warmer planet is highly unlikely and would need hard evidence for support. 3. It is evident from this whole discussion that the slippery nature of water vapour content and evaporation is one of the major uncertainties in the Greenhouse Theory. Hah. Yet another thing that the models get wrong to add to my list! I guess it shouldn’t surprise me as the models do such a bad job on clouds. It’s my understanding that constant RH is an emergent property of the models rather than a specification. 7%/K is about right for constant RH using the 1976 standard atmosphere at 288.2 K surface temperature. Note that the models in the graph that had the highest precipitation also had the lowest climate sensitivity, so you may be on to something here. It may seem at times that I’m defending the consensus and the models. That’s only partly true. I’m trying to see what’s correct and a lot of what passes for skeptical argument is far from correct and needs to be countered. I thank DeWitt Payne for his remarks and applaud the critical approach he has described in his final sentences. I think it very useful and helpful to be critiqued, with all statements subjected to scrutiny. I intend continuing our discussions on the new First Law/Second Law thread. It’s not that colder bodies have no effect on warmer ones, it’s that the interaction between them cools the warmer body, as the excerpt from Incropera and DeWitt makes clear, not by the cold body exporting “cold’ to the other one, but by importing heat from it. What the interaction doesn’t involve is an importation of heat by the warm body from the cold one. At no stage, choosing a six-pack from the cool room, did I feel warmer than when I entered. Does the radiation that the colder body emits in direction of the warmer reach the warmer body? If not, what happens to it? This, indeed, is the issue to be resolved. See Sod’s post on back-radiation where it gets an airing. on July 24, 2010 at 2:03 am | Reply Matt J. Wrong. The cooler body CAN warm the warmer. You must have forgotten the all important clause of the 2nd Law “by itself” or “without compensating changes”; as in “heat does not flow BY ITSELF from a cold to a hot one”. But it CAN flow, just not by itself — whatever that means. Learning just what that means IS a major topic of any good physics book or lecture on the 2nd Law of Thermodynamics; Kubo psent almost an entire chapter on it. The example that has been given over and over in this forum is a blanket, which is cooler than the person using it, yet warms the person. How? Because it reduces his LOSS of heat. But at least in some sense of the word, that IS warming. It is also a good analogy for the role of atmospheric CO2 which, while remaining quite cold, slows the surface’s loss of heat, therefore is justly called the proximate cause of global WARMING. Matt J, a moment’s reflection should convince you that the “blanket” analogy for global warming is scientifically false. A blanket does its job of keeping a body warm by preventing convection from diffusing away the body’s generated heat. Whether I am lying on top of or beneath the blanket my body is converting chemical energy into heat. On top, the circulating air takes the heat away and I feel cool; beneath, the air can’t do its job and I feel warm. On the other hand, according to AGW science, GHGs warm the surface by back-radiation (see sod’s post on the subject). Convection and radiation are very different forms of heat transport. The blanket analogy is false. After all, the crux of the argument is that one group of people are saying radiation from the atmosphere affects the temperature of the surface, and another group are saying it can’t happen. Both agree that the 2nd law of thermodynamics says that heat flows from the hotter to the colder. So rather than joining the chorus of people with a slogan, instead make a bigger contribution and point out what specifically is wrong in any of the steps above, or in the preceding or (especially) the subsequent articles on this subject. The subsequent article – The First Law of Thermodynamics Meets the Imaginary Second Law gives a worked example of how the radiation from a colder body affects the temperature of a hotter body. The article also explains how there is no “perpetual motion machine” and shows how more radiation is flowing from the hotter to the colder than the reverse. All you have to do is explain what is wrong with it specifically. Please see my post on the referenced article, together with a reply to a response. on July 26, 2010 at 12:35 am | Reply Matt J. No, “a moment’s reflection” does not lead me to the conclusion you claim. Rather, more than just a moment’s reflection has lead me to believe that anyone and everyone who raises the objection you raise, simply does not understand the correct use of analogies. Of COURSE in the one case, it is convection, and in the other, radiation. But in both cases, less heat can flow out, therefore the body in question becomes warmer. All the rest is detail, detail that alas, is often poorly analyzed, especially by people who complain about “back radiation” as if the 2nd Law were violated by its heating activity. Of course it is not violated. This has been explained to you many times now, and you have never even showed that you understood the explanation, far less have you even approached rebutting the facts of the case: back-radiation causes the surface to lose heat more slowly, therefore it reaches a higher temperature. The temperature of a surface that is losing heat, whether slowly or quickly, won’t increase. Sod claims that back-radiation heats the surface directly. As to analogies, we can co-exist with our different requirements of them: you’re happy with analogous outcomes; I think they should embody physical processes. The greenhouse analogy purported to do this: GHGs and the greenhouse roof both allowed sunlight in, blocked outward-bound infra-red and back-radiated it to heat the greenhouse/planetary surface. on July 26, 2010 at 6:20 pm | Reply Matt J. You say “The temperature of a surface that is losing heat, whether slowly or quickly, won’t increase. ” This is obviously false. It would be true ONLY if by “losing heat” you meant a NET loss of heat. But that is the wrong interpretation here. For whether in the blanket analogy, or in the real topic, the earth-atmosphere system, the relevant surface is both losing heat and gaining it at the same time. In the one case, the heat gain is from digesting food, in the other, from the sun. Do I understand your elaborated argument correctly: the surface simultaneously cools by emitting radiation and warms by absorbing radiation from the atmosphere; it absorbs more energy than it emits; and, hence, it warms up? If so, the implication is that the surface’s radiative flux is weaker than the atmosphere’s and, accordingly, its temperature is also lower. This would be so in the case of the weather phenomenon called temperature inversion (which may be common at night) in which case there is no conflict with the 2nd law of thermodynamics, but not otherwise. on July 27, 2010 at 12:54 am | Reply Matt J. No, you do not understand it correctly. Perhaps if you would drop your determination to equivocate, you would have understood it by now. By no means did I claim that one and the same surface both cools and warms at the same time. I claimed the same surface both loses heat and gains it at the same time. But this is not the same thing. If you actually understood thermodynamics, you would think of many examples when a surface loses heat without cooling, or gains it without warming. Think of the phase curve for water as an example. At boiling point, it receives heat without changing temperature, remaining at 100C. Similarly for at melting point. You need to take some time out to learn some thermodynamics before you can pretend to pick holes in the thermodynamics arguments SoD has presented, which are based on the sound physics checked and re-checked by physicists with far better credentials than any of us in this forum. Again: Trenberth’s argument, copied by so many in so many other sources, concerning the flow of heat from Sun to surface and atmosophere finally out to space, does not violate the 2nd Law of Thermodynamics. Every attempt to claim that it does has failed, usually because the claimant did not understand either the argument or the 2nd Law. Sometimes because neither was understood. Now I will admit that from his famous diagram, it is easy to see only how the 1st Law is observed. That the 2nd is also observed is true, but hardly clear. But since you are the one claiming it is violated, the burden of proof is on you. You shoulder the burden very badly. Can anyone refer me to a book that discusses thermodynamicsand includes the mathematical formulae? Preferably from one of the “greats” (people like Steven Hawking, Sir Isaac Newton, or Albert Einstein). on February 18, 2011 at 7:26 pm | Reply Matt J. Seriously: we could refer you to a basic text on thermodynamics by “one of the greats”, namely, Weisskopf, Fermi, Planck or even Kubo, but I think you would be disappointed. The books are too old fashioned. And though they contain ots of “mathematical formulae”, they don’t contain the one wyou really want for understanding THIS thermodynamical issue. There has been a “sea change” in the way thermodynamics is taught since the Era of the Great Men. I can think of two major ideas that have vastly improved and simplified the way Thermo is taught: 1) skip all the 19th century pre-quantum methods, go straight to quantum statistics 2) the new description of ‘entropy’ as the tendency of energy to spread. When I learned thermo in upper division classes, we had the benefit of the 1st, but not the 2nd. 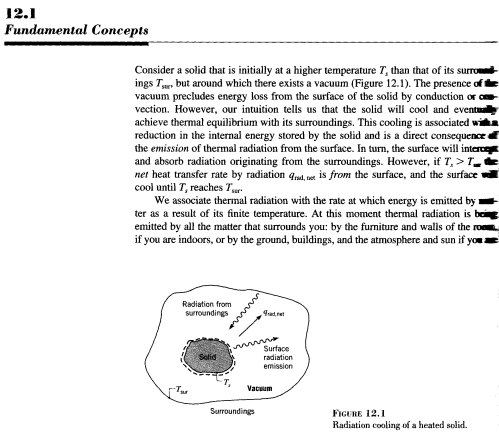 But we did not cover how to apply these principles to radiative heat transfer at all. And that is what you really want here. “An Introduction to Statistical Thermodynamics” by Enrico Fermi. A Dover reprint. He has some “mathematical formulae”, but to his shock, he discovered American college students of that generation did not know calculus ery well, so he used lots of pictures to illustrate path integration! “Treatise on Thermodynamics” by Max Planck. Also a Dover reprint. But also available as an eBooks PDF free download. Good, but very old fashioned. “Pauli Lectures on Physics: Vol 3, Thermodynamics” said to be overflowing with Pauli’s insight, I just didn’t see it so helpful. But you do recognize Pauli as one of the greats, don’t you? Then, of course, there is always the Feynman Lectures. He has a section on thermodynamics, too. Now speaking of ‘greats’, you might not recognize their names, but Landau and Lifschitz were deservedly famous Soviet physicists. They did an physics lecture series for undergraduates, too. Vol 5 on “Statistical Physics” includes the statistical basis for all the laws of thermodynamics and a good discussion of thermodynamic quantities. But my favorite is still Kubo, even if his claim to be one of the ‘greats’ is rather weak. No Nobel Prize, but he did win the Boltzmann Medal for his work in statistical physics. I have the Russian translation of his “Statistical Mechanics”. One of its marks of excellence is the large collection of problems — some with, some without solution. At the end of the thermodynamics section Feynman recommended only one book for readers who wanted to take the matter further.